Indigenous homelessness is a human condition that describes First Nations, Métis and Inuit individuals, families or communities lacking stable, permanent, appropriate housing, or the immediate prospect, means or ability to acquire such housing. 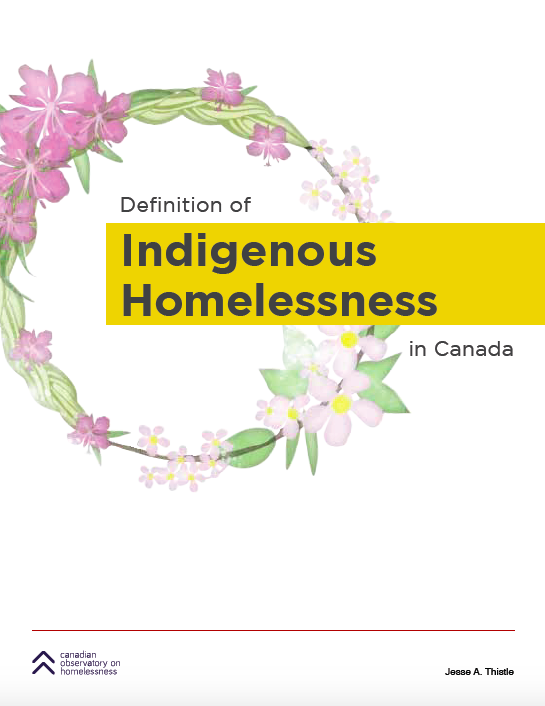 Unlike the common colonialist definition of homelessness, Indigenous homelessness is not defined as lacking a structure of habitation; rather, it is more fully described and understood through a composite lens of Indigenous worldviews. These include: individuals, families and communities isolated from their relationships to land, water, place, family, kin, each other, animals, cultures, languages and identities. Importantly, Indigenous people experiencing these kinds of homelessness cannot culturally, spiritually, emotionally or physically reconnect with their Indigeneity or lost relationships (Aboriginal Standing Committee on Housing and Homelessness, 2012).